The roller coasters at Universal are serious with a capital S; in fact, six of the top eight attractions at IOA are thrill rides. Of these, three will not only scare the heck out of you but will also drench you with water. 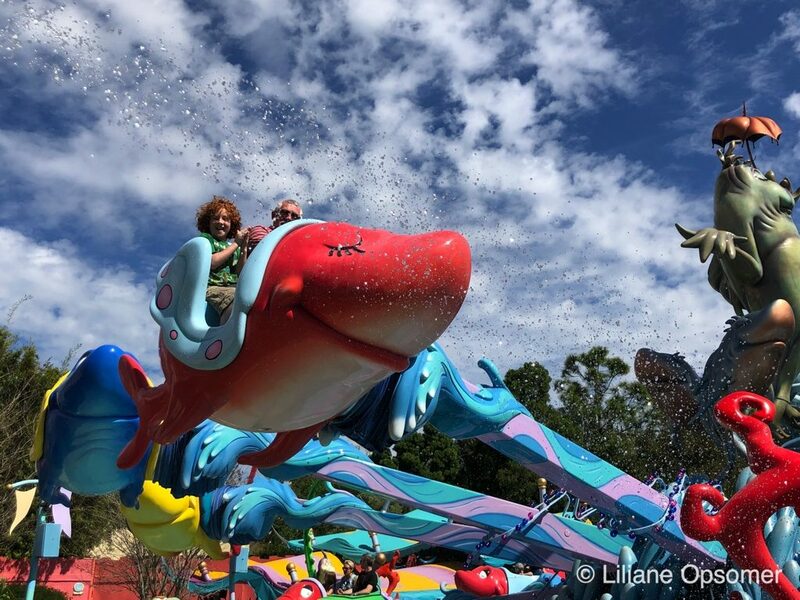 But there is more, as even a ride as harmless as One Fish, Two Fish, Red Fish, Blue Fish or a speaking fountain (yes, you heard this right) can get you wet! Here is an overview of all the rides and what to expect. Dudley Do-Right’s Ripsaw Falls features characters spun off from the old Rocky and Bullwinkle TV show. Dudley is a cheerfully incompetent Canadian Mountie who pursues Snidely Whiplash, his nemesis, throughout the Great White North. Snidely inevitably tries to kidnap Nell, the girl of Dudley’s dreams, and Dudley (with trusted horse, Horse) rescues her, usually in spite of himself. IOA’s tribute to the cartoon is a flume ride similar to the Magic Kingdom’s Splash Mountain. Riders sit single file in log-like boats and bob along a man-made river, floating past mostly static scenes telling the story of Snidely kidnapping Nell, with Dudley’s eventual rescuing. As far as log flume rides go, Ripsaw Falls is pretty good. There are several medium-size drops during the 5-minute ride, and a heart-stopping 75-foot one near the end. Universal claims that this is the first flume ride to “send riders plummeting 15 feet below the surface of the water”; you’re just plummeting into a tunnel, but it’s a nifty effect. The ride queue and loading area have some visual gags that would make the original show’s writers proud, and the on-board ride audio is also good. This ride will get you wet, but on average not as soaked as on Popeye & Bluto’s Bilge-Rat Barges. If you want to stay dry, however, arrive prepared with a poncho. 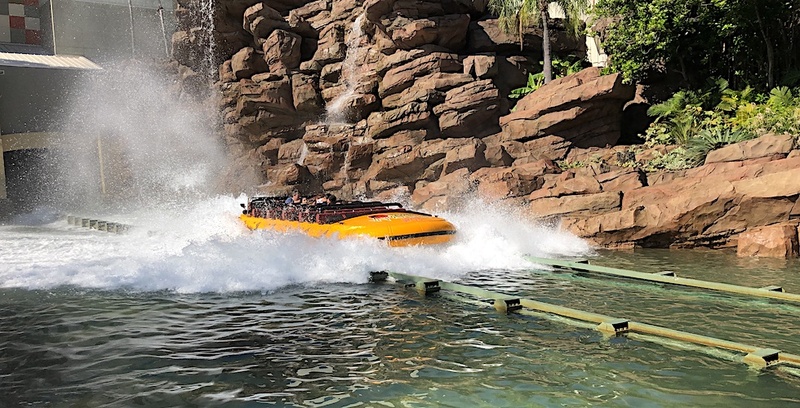 If you’re going to ride both Ripsaw Falls and Bilge-Rat Barges, see them one after another during the morning (if it’s sunny enough to dry you off) or at the end of the day before slogging back to your hotel. After riding, take a moment to gauge the timing of the water cannons that go off along the exit walk. This is where you can really get drenched. If you don’t want to ride, you can pump quarters into the water sprayers along the bridge leading to Skull Island and amuse yourself by dousing guests who just survived the big drop. Hands-down, this is our favorite whitewater raft ride on the East Coast. 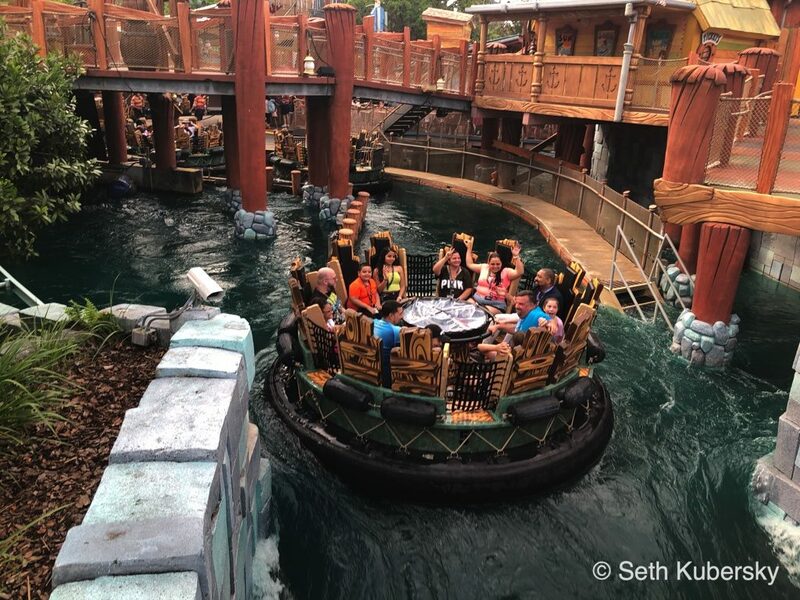 Bilge-Rat Barges seats 10 riders at a time on a circular raft down a man-made canyon of gushing rapids, waterfalls, twists, turns, and dips. Some of the scenery is visually interesting, such as the 18-foot octopus crammed into a cave two sizes too small, but the minimally moving props along the side don’t quite make for an immersive story line. 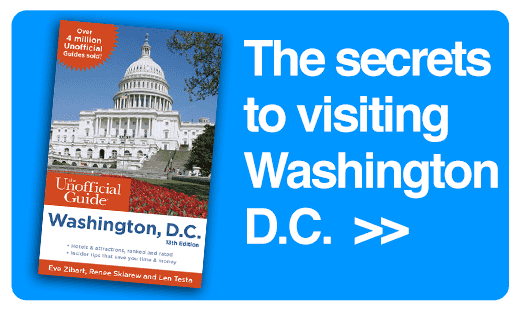 If you didn’t drown on Dudley Do-Right, here’s a second chance. You’ll get a lot wetter from the knees down on this ride, so use your poncho or garbage bag and ride barefoot with your britches rolled up. Each raft has a covered center console into which you can place backpacks, socks, and shoes; lockers or zip-top bags are strongly suggested for anything electronic. Some people ride Bilge-Rat Barges and Dudley Do-Right’s Ripsaw Falls consecutively, right before leaving the park, to avoid sloshing around in wet clothes most of the day. Some children may be frightened more by the way the rapids look, and by the screams coming from the ride as it passes through Toon Lagoon, then by the roughness of the ride itself. These are screams of laughter. If your child is apprehensive about riding, take them to any of the platforms overlooking the ride to see how much fun everyone is having. 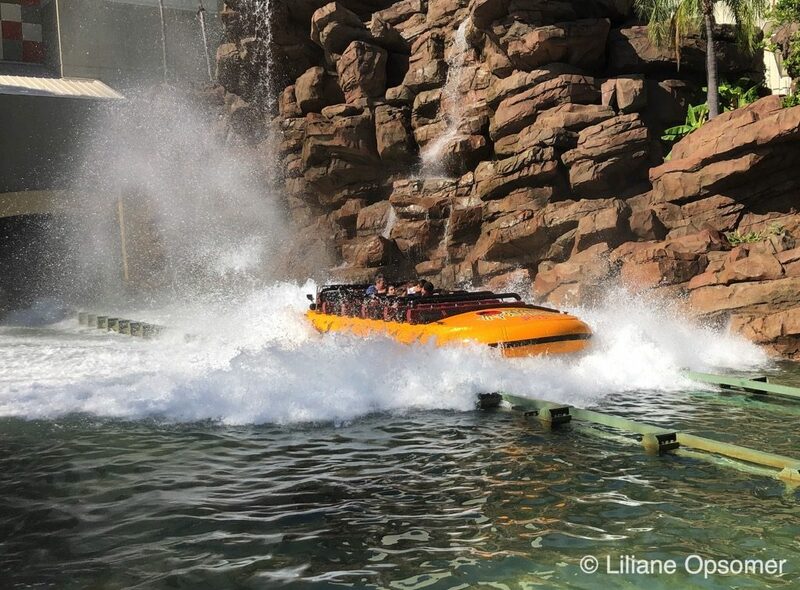 Jurassic Park River Adventure is inspired by a scene in author Michael Crichton’s original Jurassic Park novel, and one of the original attractions at Islands of Adventure. Guests board tour boats for an aquatic ride through the grounds of Jurassic Park. Everything is tranquil as the tour begins, as the boat floats among large herbivorous dinosaurs such as ultrasaurus and stegosaurus, along with prehistoric-looking plants and the occasional geyser. 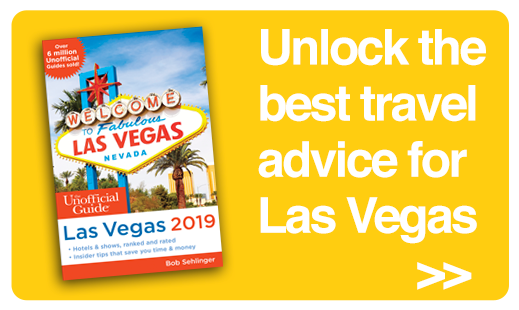 To no one’s surprise, something goes horribly wrong, and your tour boat is nudged off course by a dinosaur at exactly the most inopportune time: just as you’re floating past the vicious raptor enclosure, whose gates have been mysteriously unlocked and left open. Before you have time to ask what OSHA’s inspectors really do during the day, your boat is climbing through the inside of the raptor facility amid the destruction and carnage wrought by the escaped animals. Your first face-to-face encounter with a T. Rex is also your last, as you find rescue by plunging 85 feet (the tallest water descent in the world when it was built) into the river below. The drop is a doozy; the scenery, background music, and ride narration are all done well; and Jurassic Park River Adventure is overall one of the more immersive attractions in the entire resort. But the dinosaurs look increasingly arthritic, especially in comparison to this ride’s California cousin, which is being re-themed to the Jurassic World franchise during 2019. 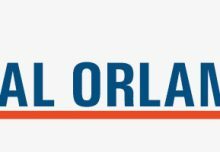 Hopefully, the Florida version will get an upgrade of its own before too long. 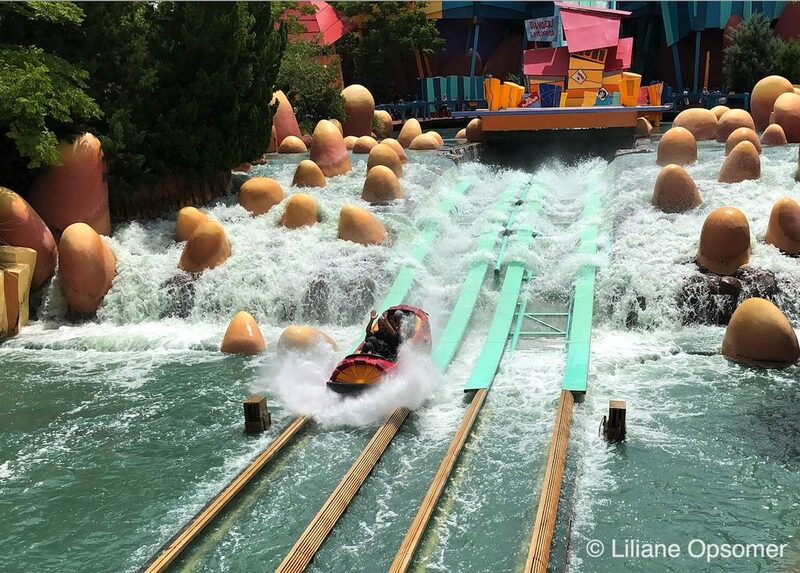 Riders don’t get as wet on River Adventure as they do on Bilge-Rat Barges or Dudley Do-Right’s Ripsaw Falls. Though the boats make a huge splash at the bottom of the 85-foot drop, you can stay relatively dry if you are sitting in an interior seat. Still, bring a poncho or plastic bag if you want to keep as dry as possible; paid lockers are located inside the queue. There’s a viewing area to the left of the ride’s final, big drop, where you can see how wet riders are getting before you decide to ride. Young children must endure a double whammy on this ride. First, they’re stalked by giant, salivating (sometimes spitting) reptiles, and then sent catapulting over the falls. Unless your children are fairly hardy, wait a year or two before you spring the River Adventure on them. 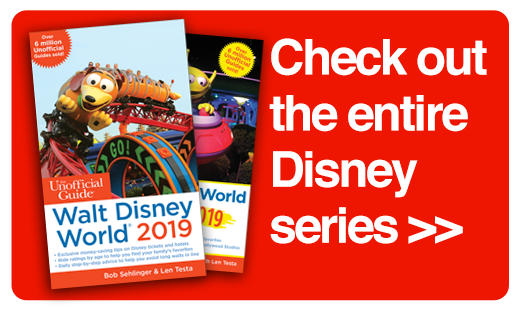 Imagine a mild spinning ride similar to Disney’s Magic Carpets of Aladdin, TriceraTop Spin, and Dumbo rides, only with Seuss-style fish for ride vehicles, and you have half the story. The other half involves yet another opportunity to drown. Guests board a fish-shaped ride vehicle mounted to an arm attached to a central axis, around which the ride vehicles spin. Guests can raise and lower their fish 15 feet in the air while traveling in circles and trying to avoid streams of water sprayed by other fish mounted to “squirt posts” around the ride’s perimeter. You can avoid most of the spray by going up or down at the right time. If you pay attention to the color of your vehicle and listen to the song played in the background, you can (eventually) figure out when to move your fish. 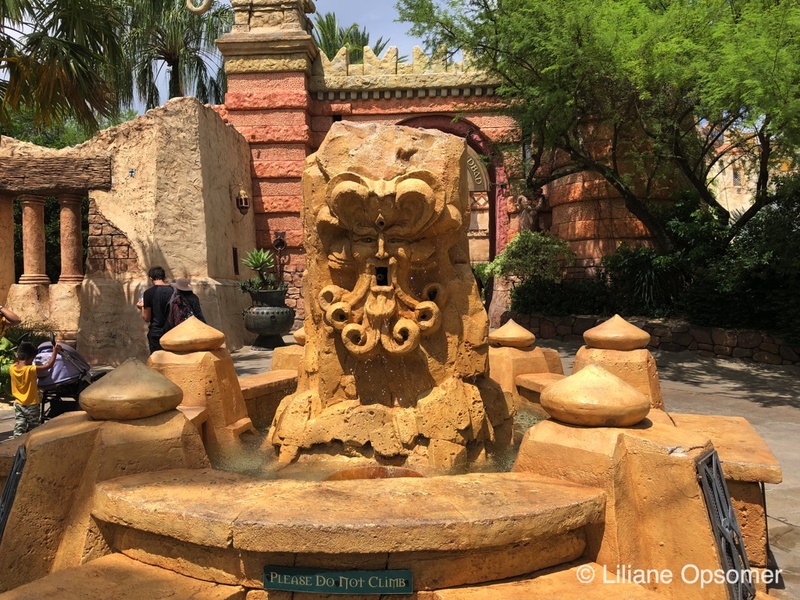 The best attraction in the Lost Continent may be the Mystic Fountain, an interactive talking fountain. A team member behind the scenes controls the fountain and is able to talk to and hear from anyone who approaches. 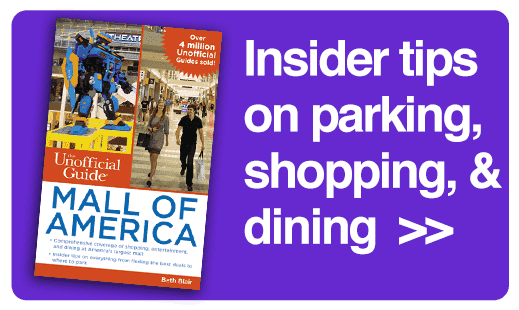 Many kids seem mesmerized by it as the fountain talks, sings, and squirts them with water. at a Universal hotel, you may consider going on these rides and then returning to your hotel for a change of clothes. 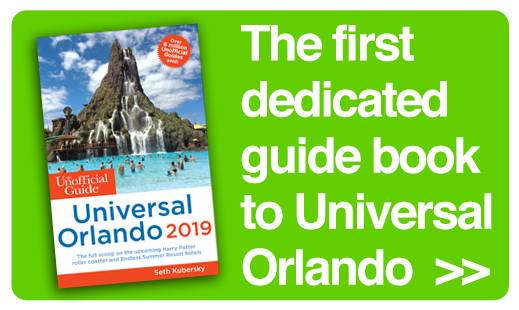 For all there is to see and do at Islands of Adventure, check out The Unofficial Guide to Universal Orlando by Seth Kubersky. 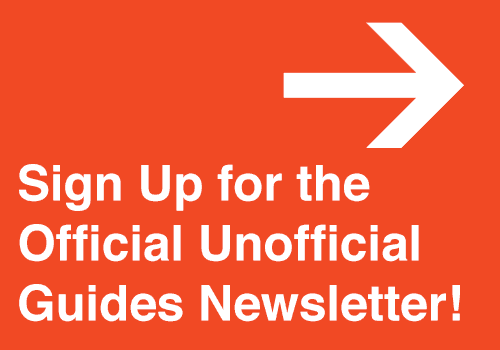 If you enjoyed this post, please subscribe to our YouTube channel and sign up for our newsletter here.